Questions to consider if you’re thinking about installing or upgrading your home’s oil heating system. The Energy Kinetics 2000 multi-fuel home heating system will save you money for years to come. Today, heating costs can be significantly reduced by employing the latest technology; such as the Energy Kinetics System 2000. Efficient technology can reduce costs by lowering your homes annual energy consumption for home heating and hot water. When it comes to heating your home, the more efficient your furnace, the lower your heating costs will be. Fuel efficiency for oil heat is reflected in a rating known as the Annual-Fuel-Utilization-Efficiency, or AFUE rating. The issue with AFUE is that it only measures chimney related losses to come up with a rating. This is like only measuring a cars mileage rating for MPG based only on city driving. AFUE assumes that a boiler runs like a furnace which cools between demand calls, doesn’t operate all summer or most of the spring or fall. It doesn’t take into account other factors like standby temperature for a tankless coil, or a draft regulator which pumps heated air into the chimney. It also doesn’t consider jacket losses for a basement unit. Over the course of a year, the actual efficiency for a boiler with a tankless coil is closer to 56% efficiency, not the 80% indicated by AFUE. • Low chimney loss – System 2000 uses a unique counterflow design that incorporates over ten feet of heat transfer passage to minimize chimney loss. • Almost No Jacket Loss – the System 2000 is raised 18” above the cold floor and has 2-4” of insulation all around. • Near Zero Idle Loss – Testing in a Department of Energy study conducted by Brookhaven National Labs found the System 2000 has the lowest idle loss of all systems tested. • The System 2000 spiral boiler holds 2.5 gallons of water allowing it to heat-up six times faster than our competitors. 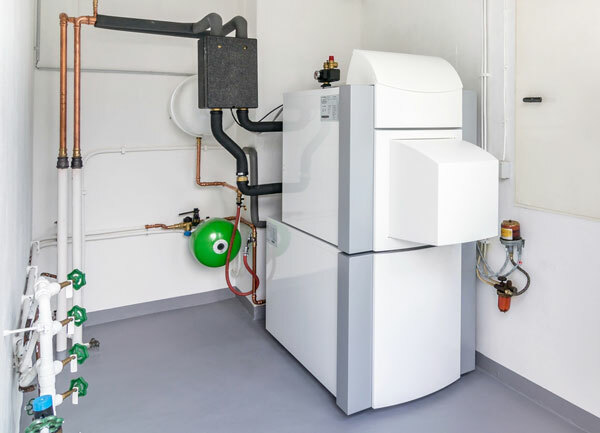 • Combined with Energy Kinetics high performance hot water system, the System 2000’s Hybrid Energy Recovery® captures the heat other boilers waste and virtually eliminates idle loss while providing for all of your heat and hot water needs. • Zero draft regulator or draft hood loss – System 2000’s advanced design uses outside air for combustion and does not require draft regulation. Energy Kinetics high efficiency gas and oil boilers are Energy Star Most Efficient rated. Their design achieved the best annual efficiency in the Department of Energy’s lab report in heat and hot water systems from around the world! Energy Kinetics combines the best technology, unique well insulated mass boilers , their high performance hot water system and Hybrid Energy Recovery® (thermal purge control. This minimizes loss, and delivers unsurpassed comfort and the lowest energy bills. If you’d like to learn how to cut your heating bills 40% or more give Halle Oil a call and ask about the Energy Kinetics System 2000, Accel CS, and 90+ Resolute high efficiency gas and oil burners! When it comes to home heating, the more efficient your furnace is, as general rule, the lower your home heating costs will be. Fuel efficiency for oil-to-heat energy is reflected in a rating known as its Annual Fuel- Utilization-Efficiency (AFUE) rating. Presented as a percentage, the higher the number, the more heat the unit produces and the lower its environmental impact. AFUE percentages are the common measurement of a heating units efficiency. It measures the amount of heat produced compared to the amount of fuel needed to supply the furnace. For example, a furnace with an AFUE rating of 85%, converts 85% of the fuel into heat with the remaining 15% being lost out the chimney. It’s important to understand that the AFUE only refers to the unit’s fuel efficiency (whether it’s natural gas, oil or propane) and not it’s electricity usage. In recent years, the industry has been producing more efficient units even prior to the adoption of these new rules. Typically, a furnace produced in the 70’s has an AFUE of about 65%. Today, the lowest efficiency for a new unit allowed by law is 78%, but the most efficient models can have an AFUE of up to 97%, which is close to total efficiency. Prices for boiler of furnace units are related to their AFUE, with higher efficiency meaning a higher price point. But, the higher initial cost can often be made up through lower, more efficient energy use over the life of the unit. The electricity required to run the units can vary. This will affect the payback time along with the climate where you live, how well your home is insulated, and the rates you pay for gas and electricity. “British Thermal Units” (BTUs) are a measure used to determine the heat efficiency of fuels. Not all fuels are created equally when it comes to heat. For example, oil heat has a BTU of 136,690 while propane comes in lower at 91,333. When you compare oil burners with a 90% AFUE against propane systems with an AFUE of 94% using the NH DoE costs of $2.18 per gallon for oil vs. $2.57 for propane, oil heat provides 57,257 BTUs per gallon versus propane’s 33,761. While the AFUE of the propane unit is higher, the fact that oil produces a higher BTU rate makes the overall operating cost of a less efficient oil-fueled unit less expensive to run, plus the upfront cost of the unit may be lower due to its slightly lower AFUE percentage rating. If you live in New Hampshire, consider installing an oil furnace or boiler with an AFUE of over 90%. Oil has a higher BTU output per gallon of fuel. Though highly efficient oil heating systems are more expensive initially, it will provide a better ROI over the life of the unit. Properly maintained, an oil burning unit will last 15 – 20 years, providing you with a significant savings throughout its lifetime! We sell the highly efficient Energy Kinetics System 2000 multi-fuel heating system. To learn more, click here to download the brochure or call us to speak to a home heating expert. How Oil Heat Stacks Up Against “Cleaner” Fuels. The answer might surprise you. No. 2 heating oil, the industry name for the fuel used to heat your oil-burning furnace or boiler, is derived from crude oil, a fossil fuel that has gotten a bad rap for its contribution to air pollution and global warming. Some may think that natural gas, propane or wood may be a cleaner way to heat their home, but you might be surprised to learn that oil heat is on track to become the cleanest burning fuel for home heating. In 2009, the heating oil industry made a commitment to seek higher fuel-quality standards from state governments in an effort to reduce air pollution. This included a transition toward ultra-low sulfur blends of heating oil, which today contain less than 1 percent of the sulfur content of traditional heating oil. The industry has also expanded biofuel blends, which cut emissions even further. Particulate matter has been reduced, as well. Today’s oil furnaces have become so efficient, they produce an average of only six ounces of soot per year. Although considered a renewable energy source, burning wood sends greenhouse and toxic gasses into the air, along with particulate matter. In cities and towns where burning wood is common, it is considered a major contributor to air pollution. In some areas of the state, like Cheshire County, it is not uncommon for the region to experience poor air quality warnings in the winter because of wood burning stoves. Natural gas has become a popular choice for power plants generating electricity, as well as homes and businesses, in part because it emits fewer greenhouse gasses when burned. What scientists have recently discovered, however, is that the greenhouse gas emissions released into the environment during the drilling process known as “fracking” far outweigh the emissions of burning oil and even coal. A recent Cornell University study found that “shale gas is worse than conventional gas and is, in fact, worse than coal and worse than oil,” when it comes to emissions. Many people assume that switching from oil to natural gas will cut costs and greenhouse gas emissions, but depending on the system, that may not be the case. If you were to burn the same amounts of oil and natural gas, oil will produce more heat – or BTUs – than natural gas. That means natural gas furnaces have to run longer and burn more fuel to keep your home at a certain temperature than high-efficiency oil furnaces and boilers do. This shrinks the cost savings and reduction in emissions. In older cities, like Boston, aging gas lines are susceptible to leaks. While the leaks that pose a danger are fixed, gas utilities often hold-off on repairing pipeline leaks that are not considered an immediate threat of fire or explosion. The methane from this leaked natural gas goes into the atmosphere, contributing further to global warming. Converting an old oil unit to a modern, high-efficiency furnace or boiler can save homeowners up to 30 percent on annual fuel costs. These newer models maximize the fuel burned and heat produced to reduce overall fuel consumption. On average, a newer oil unit uses less than 800 gallons of fuel oil per year.